I was on a roll with ripping through games as 2014 started, but I was stopped dead by Bravely Default. I had heard a little about it, heard the rumblings that it was as close to an old-school Final Fantasy as possible, so I decided to give it a try. After 60+ hours of play, I am so, so glad I did. Bravely Default is the best game I’ve played since Bioshock Infinite and definitely has my early vote for Game of the Year. The definitive JRPG for the modern era. Yes, really. Recommended: If you own a 3DS, yes. If you don’t, go buy one, then yes. Bravely Default hearkens back to JRPGs of years past. A large, dark chasm opens up in the sleepy village of Norende. The four elemental crystals — wind, water, fire, and earth — are consumed by darkness and must be brought back to the light in order to save the world. Sound like Final Fantasy? Well, Bravely Default is actually a spiritual successor to 2010’s Final Fantasy: The 4 Heroes of Light. The roots of Square Enix’s flagship series are very deep in Bravely Default. Magic skills are named like you’ve seen before, whether it be firaga, esuna, holy, or many others. Items are also similar, with phoenix downs and echo herbs. Side note — I only realized phoenix downs were meant to represent phoenix feathers, explaining their healing powers, about two years ago. Woops. Simply calling Bravely Default a modern Final Fantasy would be doing a wonderful game a horrible disservice. Combat is turn based, as expected. Characters can attack, use skills, or use items. If I had to pick one of the innovative things I love about Bravely Default the most, it would be the titular brave/default system. Each combat action costs one BP and the end of each turn generates one BP. Characters can dip into negative BP, using Brave up to four times in a single turn. Unfortunately, characters can’t act if their BP is negative, so you have to weigh the risk and reward. If you don’t want to go into the negatives, you can Default to defend, lower your damage taken, and save BP for a future turn. The brave/default system opens up turn-based combat to a whole new level. If your team is fully healed, rather than having your white mage attack feebly, you can default to not only lower damage, but store up an extra BP to be able to both revive and heal someone who may fall in the next turn. Maybe you want to end a random battle quickly, so you use four BP on every character on the first turn just to get it over with. Some abilities cost extra BP to use while some attacks can even steal BP from you. It’s a beautifully simple system that adds a ton of depth to an already strategic system. As you progress, characters will gain job levels. Jobs in Bravely Default are similar to jobs in Final Fantasy Tactics Advance, one of my favorite games of all time. There are some old standbys, like the Monk, White Mage, and Summoner. There are also some new jobs, like the magic-oriented Arcanist, the hits-like-a-truck Pirate, or my personal favorite, the Dark Knight (sadly, not that kind of dark knight). Each job has 14 levels to master, each of which will net you either an active or passive skill. Characters have access to the active abilities for the job they currently are, as well as a secondary active set of your choosing, plus any mixture of passive abilities they have learned. Side quests, noted with blue question marks on the map, will always end in a boss battle for access to a new job. I recommend always doing these quests as soon as you can. Jobs are doled out at such a pace that Bravely Default never gets stale. For example, I had Tiz set up as a Black Mage for a while, but didn’t end up liking it. I then gained access to the Dragoon Valkyrie job, and let him level up with that for a while. Valkyries use extra BP for their abilities to do heavy damage. Once I realized that the Red Mage can learn a passive to earn extra BP for taking damage, I swapped Tiz to a Red Mage, learned that passive, and popped it on him when he was a Valkyrie again along with Protect Ally, so he would save near-death allies and gain BP in the process. The mixing and matching of skills can be nearly endless in Bravely Default. Or, you can just ball out and go 4x Black Mage. Yolo. Weapons and magic have their own twists in Bravely Default. In most RPGs, you have to level up a class/job to learn certain abilities. For magic, Bravely Default has you buy a single scroll, say for Fire, that you can then earn access to with various jobs, like the Black Mage, Red Mage, or Spell Fencer. Instead of specific characters or jobs having their own slowly-charging gauges for limit break-style abilities, those powers are at a weapon level. If a staff user casts white magic 10 times, they can cast Rejuvenation, which will strongly heal the entire team and increase healing effectiveness. A katana user can unleash Moonshadow after defaulting five times, dealing damage and increasing physical attack for the party. 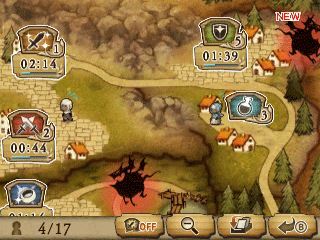 Special attacks bring a change in background music, and the boons from these attacks only last as long as the song plays. It never gets old to build up a bunch of BP, rip out a few special attacks, and just go all-out on an enemy. Special attacks can be further augmented by rebuilding Norende, which leads me to the social portions of Bravely Default. Norende is rebuilt in a build-and-wait mini game, similar to many city building games on iOS/Android. You start with a few workers that can rebuild a number of shops: weapon, armor, special move, etc. Building takes time, so you assign workers and go about your world saving duties until they are done. Any weapons/armor/items you gain access to can be bought at any save point throughout the world. Special move enhancements, like poison heal for staff moves or fire damage for sword moves, can also be gained. Connecting your 3DS to the internet once a day will net you more villagers, but also add some bosses to Norende, which you can fight at any time. They are far from necessary, but can be a nice diversion. Updating your internet data also allows you to both send and receive special character summons from other players that can be used once a day. I don’t have many… alright, any friends that played Bravely Default when I did, but you still gain some character summons from some AI friends. 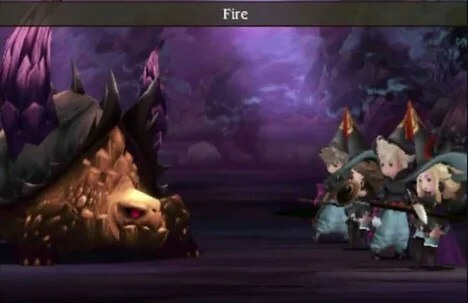 It’s another little thing that lifts Bravely Default out of the standard JRPG and into the 21st century. I can hardly believe I went this long without discussing the voice acting. All characters, aside from the nameless NPCs in villages, are fully voice acted. Cut scenes alternate between zoomed out wide like a movie and up close to really let you see and hear the emotion, of which there is plenty. When Agnes is truly angry, you can really sense it. Every time Ringabel opens his mouth, you can practically feel Edea’s eyes roll in the back of her head. A lot of backstory is revealed in optional party chats, which I loved listening to. I was expecting the typical text bubble flurry, so full voice acting was truly a pleasure. Two other tidbits that are, again, small but amazing, are that of in-battle fast forwards and the random encounter slider. After playing for hours and hours, seeing the actual attacks/spells get a little tiresome. Luckily, you can speed battle animations up to 2x or 4x. Then, there’s the random encounter slider. Kotaku wrote up a whole article about it. It’s exactly what you think it is — you can turn random encounters up to +100% or even all the way off. What does this mean? It means grinding is a lot easier. You just turn the slider up to 11 and run around until you feel strong enough. Feeling a bit overpowered? 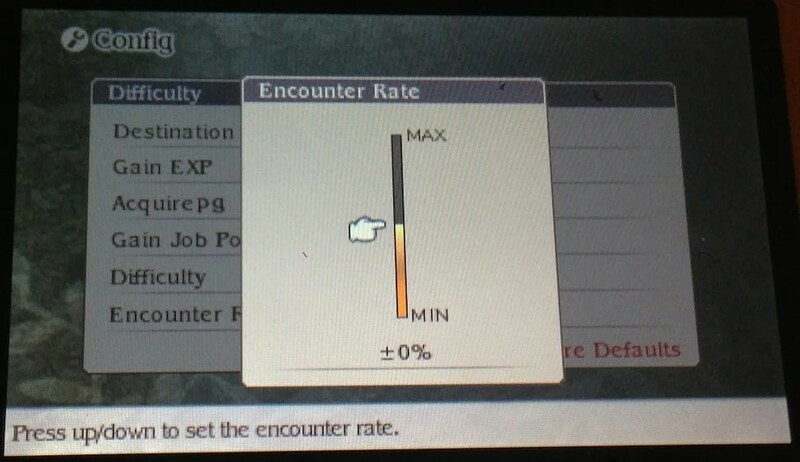 Turn the slider down to -50% so you can still progress without becoming too strong. Maybe you’re knee deep in a dungeon, low on life and out of ethers. Set the slider to -100% and run back to town. Some purists may feel this is takes away from the spirit of a JRPG, but I absolutely love it. I hope future games adopt this as a standard. Graphically, Bravely Default is beautiful to look at. Backgrounds are highly detailed, almost looking hand-painted (hell, maybe they are). Each area you visit looks completely different, whether it be flower city of Florem or the war-torn city of Hartschild. Jobs look different on each character, giving them each a unique costume. These costumes carry from fights to the overworld to towns and cut scenes, never breaking the immersion like so many games that show a default costume during cinematics. For all the praise I’ve sung, Bravely Default isn’t without it’s flaws, albeit they are few. Offensive magic is depressingly underpowered until very late in the game. There’s no way to sort items, either. This one may be nitpicking, as there isn’t that many items to use to start with, but being able to just put my echo herbs and phoenix downs on the top of the item list would have been nice. Also, there is a portion of the game that for me and, from looking around online, for many others, drags on unnecessarily. When you get to that point, you’ll know it and most likely agree. That section could have been shortened considerably, but the story line for that portion ends up making sense, so it wasn’t all bad. Bravely Default is a juggernaut. It strikes a perfect balance of old, with magic and enemy names you’ve known for 20 years, with new, like the strategic brave/default system, wonderful graphics, and full voice acting. Square Enix and Silicon Studio have the makings for a great game series here, and I am already looking forward to playing the in-development sequel. You owe it to yourself to play Bravely Default.